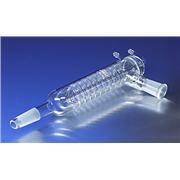 This Air Reflux Condenser is a replacement part for the 6949M series of PYREX® microchemistry kits. 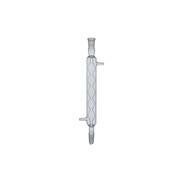 These PYREX® condensers have a high surface area per unit length of the 300mm long jacket with a 24/40 Standard Taper outer joint at the top and a plain drip tip at the bottom. 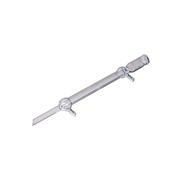 They are primarily used in distillation assemblies. 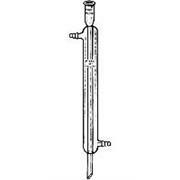 Condenser tubulations are approximately 10mm O.D. 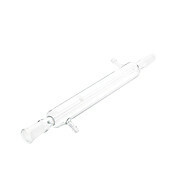 This Jacketed Reflux Condenser is a replacement part for the 6949M series of PYREX® microchemistry kits. 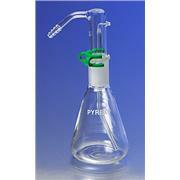 This PYREX® Friedrichs type condenser affords very efficient operation. 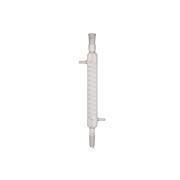 The helical inner tube fits closely within the jacket. 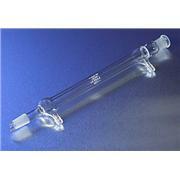 The vapor tube is sealed to the jacket at an angle of 75° and has an outer 24/40 Standard Taper joint. 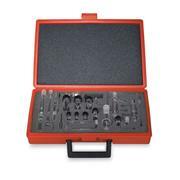 With Standard Taper 24/40 joints Inlet and outlet tubes, 10 mm o.d. 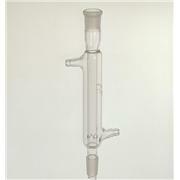 are on opposite sides, indentations at lower end of condenser tube support packing when used as fractionating column. 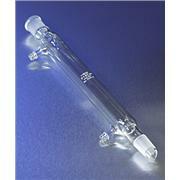 These PYREX® condensers have a high surface area per unit length of the 200mm long jacket with a 19/38 Standard Taper outer joint at the top and a plain drip tip at the bottom. 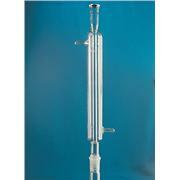 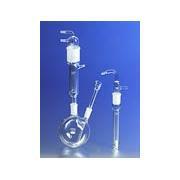 They are primarily used in distillation assemblies Condenser tubulations are approximately 10mm O.D.